Traditional dentures rest on top of the gums and are “anchored” by suction and adhesive alone. Over time the jawbone shrinks, so a denture that once fit perfectly becomes loose and starts to shift. Better chewing – Your ability to chew will be much better with an implant denture, so your diet and nutrition will improve. No slips – You’ll have a lot more confidence knowing that you can have a conversation, laugh, and share a meal without any embarrassing slips. Improved comfort – Since a stabilized denture doesn’t shift around, your gums will stay much more comfortable. Traditional dentures last about 5-8 years. 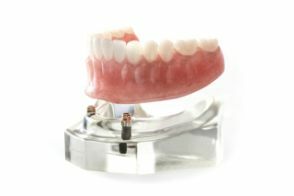 With implant dentures, there are two main parts: the implants and the denture. The implants themselves can last many decades with basic at-home maintenance and regular dental care. As for the denture itself, there isn’t much long-term data because implant dentures are relatively new, but many patients have gotten at least 10 years of enjoyment from their appliance. In part, this is because implants help retain the bone mass in the jaws, so they won’t shrink as much as they would with regular dentures. How Long After Your Teeth Are Pulled Can You Get Implant Dentures? This will vary from patient to patient, but it will generally take between 3-6 months to fully heal after having your teeth pulled. However, there are options for an immediate denture to help you through the transition, so you won’t have to spend all of that time without teeth! Every patient has a unique dental history and different needs and goals, which means that the cost varies widely. For example, some patients may need a bone graft, while others do not. Having said that, a good ballpark for implant retained dentures for both the upper and lower arch is about $10,000-$15,000. The best way to get a more specific idea of how much an implant denture would cost is to schedule a consultation with an implant dentist in Parsippany. They’ll give you a treatment plan that includes any procedures that need to be done during the process and can answer any questions you have. Implant dentures are a fantastic way to restore your smile and self-confidence. For many patients, their only regret is that they didn’t do it sooner! Dr. Alan Rauchberg is a general and implant dentist who loves helping his patients lead happier, healthier lives through better oral health. He knows that loose-fitting dentures can impact the quality of someone’s diet, as well as their personal and professional life, which is why he loves being able to offer implant retained dentures. If you’d like to know more about how this option can help you, he can be reached via his website or at (973) 334-3777.